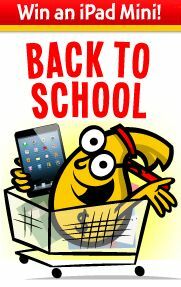 MrRebates has the best back to school promotion going on right now, IMHO, with 250 stores offering increased cash back through August 25th, PLUS they’re giving away a free iPad Mini per day! No purchase is required, just click through to visit one of the stores in their Back to School promotion for a chance to instantly win. Standout merchants include: Dell at 5%, Foot Locker at 8%, and Shoebuy at 15%. Ebates has a back to school promotion going through August 26th that increases their rates on 18 participating stores. Standout merchants include: 3% at Amazon in the categories of Textbooks and Luggage (including backpacks), 8% at JCPenney, and 6% at Macy’s. FatWallet has a dozen stores offering extra cash back through August 26th. Standout merchants include: Walgreens at 8% and Lands’ End at 6% (the same rates as sister site Ebates, but with no minimum to cash out for PayPal vs. a $5.01 min. at Ebates) and Tommy Hilfiger at 8%. Upromise has not yet started their Back to School promotion, but their Summer of Savings Calendar shows they’ll be “featuring” merchants in different back to school themes each week from 8/12 through 9/1. There’s no promise of increased cashback; in fact, only one of the merchants in their the current weekly “feature” of travel has a cashback increase. However, their everyday rate of 5% on Gap, Old Navy, and American Eagle is about double that of their competitors. Memolink has a Back to School promotion going on with increased shopping rates (paid in points per dollar, versus % cashback) for around 40 merchants. Calculating their rates is tricky since they are a points-based program, but if you multiply the number of points per dollar times .000625 then move the decimal place over two, you’ll get a percentage equivalent. TBH, I wasn’t industrious enough to check more than a couple of rates, and the ones I did check were just average. These were the only programs I checked that were offering Back to School increased cashback promos. If you know of any others, please leave a comment and let me know, and I’ll add them to the list!